SoCS – click. click. click. No, it’s not the annoying sound fake nails make on the table when someone’s tapping nervously, though it does grate on the nerves just as badly. Those damn middle school cliques. We consider ourselves endlessly blessed that Bear hangs with a strictly no drama llama crowd. She loves her friends, she loves her team, and overall I’d say middle school is off to a good start. But a middle school without girl cliques only exist in another dimension and we’re stuck smack dab in this one. This means that occasionally my no drama llama shows up hating her hair or her clothes (yes, all of them) or the fact that she doesn’t own twenty pairs of shoes. She doesn’t look like everyone else (hello, that’s a good thing) or have those name brand labels or is rolling in dollas. In other words, she’s normal. And normal tends to clash with cliques. I have this recurring dream where I get to go into the middle school and meet with girls. No, not a brass knuckles sort of meeting…but maybe if we could just sit them in a room…small groups, facing each other without their posse to hide behind, talking honestly until we chip away at some of the walls these girls build around themselves…well, maybe we could make some progress with the cliques. 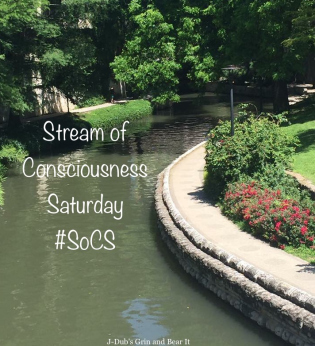 Linda’s stream of consciousness post is our Saturday fun. This week’s prompt was to use a word with “liqu” in it. My kiddo is turning 20 this month. Grades K through 5 were wholesome goodness. No llama drama as you call it. But in 6th grade, she was bullied to a point where she changed schools for her 7th grade year. We tried everything before switching but eventually we had to face up to what we could control and it is not how other people behave or misbehave as the case may be. We learned first-hand how cliques can be brutal which is why I have the same dream as you. Also not in a brass knuckles way but in more of a therapeutic way. Great post about a common issue. Thank you for writing this. Thanks for adding your thoughts. I’m so sorry it reached that level for your daughter – bullying can be brutal, and it hits girls that age especially hard. I’m so glad it was something she shared with you so you could handle it as a family. She kept it too herself. She’d just say she felt sick and couldn’t go to school or she’d call us to pick her up because she had thrown up. In the beginning, she had symptoms of a physical illness. When she finally told us some of what was going on, we told her to rise above. She did for as long as she could. She begged us not to go to the school staff as it would just make things worse. There are times I wished her dad and I had stormed in demanded action. We only learned the true extent of what happened after she was out of that environment. She tried so hard to handle it herself and spare us the details. In hindsight, this experience made her stronger. Though still I would not wish on my own worst enemy. Oh, bless. They do so much want to be independent and handle their own stuff at that age. There are times now my son shares a problem and immediately follows it with BUT DON’T CALL THEM.